Virgo10's Laughing Place! Trip #5 Comes to an End. Trip #6 Begins! Wednesday, September 18th dawn sunny and in the 90's again�so what else is new?? As this was my last full day (sob!) at the park, I wildly considered hitting every park. When common sense reasserted itself, I choose to go to my 2 favorite parks and get in some quality time. I arrived at Typhoon Lagoon about 10:15 a.m. and rode around in the river trying to soak up as many memories as possible. After all, these have to last me through another loooong New England winter. Then it was off to the Shark Pool. I took the water proof camera that I'd bought and it performed very well. The pictures were clear and reasonable bright, considering that is was mostly cloudy while I was in the pool. Went down one of the slides again and swam out to meet the big wave too. Then it was one more trip around the park in the river and time to say good bye to Typhoon Lagoon. Laugh if you will, but I had tears in my eyes as I left. Got back to PO and changed and then went off to EPCOT�getting there about 1:30 p.m. First stop was Innoventions to send Email to some of the people I've met on the IRC. Then, much to my delight, I got to see the new show at The Universe of Energy with Ellen DeGeneres. I really enjoyed it and thought it much improved over the old version. Once again there was a very short wait to get on, less then 10 minutes. Then another delight, Horizons was open and operating. I really love that ride, especially the area with the Omni type screen. Hope Disney has second thoughts about shutting it down. It's one of the rides I never get tired of. Went into the Body Works next. Thought I'd seen everything in there but this time I found The Cranium Command (a 10+) and "The Making of Me" (very well done). Next stop was the Journey into Imagination area. On my way over there I found the talking drinking fountains. It was very amusing watching people's reactions to them. I always like to spend a few quiet moments with the fountains at JII. I spent quite a while catching the water as it came out of the fountain. Began my trek around the World Showcase. Went into Mexico and did El Rio del Tiempo. I still think this is a fun ride and especially like the fireworks at the end. Next I stopped at the American Experience. They had a pre-show performance by a wonderful group of people singing patriot songs arcapella . I exited the show just in time to do the Marcarana one more time. At England I watched the final number of the British Invasion and had one last beer (small) at the Rose and Crown Pub. Walked over to Canada to grab a spot for Illuminations. Out of all the spots I've watched that show, Canada is my favorite. We've always ended our trips to WDW by watching Illuminations and, as I'm sure you can all understand, when the shows over you realized tomorrow I'll be going home. .
As we began the mass exodus out of EPCOT there were more fireworks being shot off by the fireworks convention people. Gee, I'll have to plan every trip around this group! We could actually see these as well as hear them and it was a fun way to exit the park. Don't know whether it was because there were less people there or if Disney finally is getting a handle on the bus situation but most trips out of EPCOT were quick and went smoothly. One interesting note is that one night I believe a security person pulled a woman out of line that cut to the front. If that's what happened all I've got to say is, it's about time! I think they made her wait until the entire line was gone. Good!! The bus driver we had on the trip back was very funny. He advised us to be careful exiting the bus when it came to a stop as the sidewalks would be moving the same speed as the bus. Also, young children left on the bus will become the sole property of It's a Small World! HaHa! Got up early Thursday, September 19th. Got breakfast for the last time but didn't have much of an appetite. Settled the bill and went back to the room one last time. Filled out the questionnaire and asked for more 6 a.m. fireworks! And Now! Trip #6 or The Year I Wasn't Suppose To Go To Disney World But Did Anyway! Yikes! Only 120 days and I have no money. I wasn�t suppose to go this year. So commenced the summer that never was. Worked, ate, slept...worked, ate, slept...cleaned the house...went to Michigan for a internet meet...worked, ate, slept ad nauseum. And then it was Sept. 7th, my last night at work and a half shift at that. I was ready, I was excited, I was exhausted but I was out of here! Actually slept from 10:30pm to 3:10am. Got up, dressed, finished packing and made the 5am bus to Logan with no problems. The plane left Logan at 7:10am and arrived in Orlando at 9:45am. The flight was crammed, hot and no frills. I would seriously consider paying extra next time to avoid this. After only a short wait, I was on the Mears van to OKW and OKW was the first stop! I was at the lobby checking in by 11:05. Made better time then I could have hoped for. Met up with the kids (hereafter knows as Chris and Jen) and found out I could check into my room immediately. I got my length of stay pass and my E-Ticket for tonight then went off to my room to unpack. Room 4010 is located about 2 minutes from the bus stop and the pool. We all decided to go to have lunch at the Electric Umbrella restaurant at EPCOT. My original plans were to visit the Village Marketplace and go check out the Coronado Springs resort. But Chris and Jen informed me that Gardenia would be taking us there after the RADP meet on Thursday for a "tour". I had lunch while watching the fountain. Have you ever tried to eat while you�re grinning ear to ear? Then it was to Horizons first (love that ride) then to Body wars etc., Journey into Imagination and Spaceship Earth. I was off to OKW for a nap. Returned to the Magic Kingdom about 8pm. Saw the Cakesil finished for the first time. I�ll be glad to see the real castle back. Spectromagic started at 8:15pm and I was stuck at the bridge you cross over to get to the front of the castle because it was roped off. This was OK by me and I stayed there to watch the parade. But there must have been a claustrophobia convention going on because 5 or 6 people got to this area and totally freaked out. One woman said, "Are they trying to keep me in this park against my will?" Some people need to Chill Out!! After the parade and fireworks (Tink did fly!) I went for Ice Cream on Main Street (had confetti and cream) then began to walk towards Splash Mountain. By now the crowd had been reduced to mostly E-Ticket people and believe me when I tell you, there was NOBODY home. I was suppose to meet Chris and Jen at 10pm but seeing how it was only 9:30pm I figured I�d go on Splash Mountain. No line! Woo Hoo!! Splash Mountain has finally lived up to it�s name. I was totally soaked by the end of the ride. Met the kids when I got off and went on BTMR X2 to dry off. Then it was off to the Haunted Mansion, which looked spruced up in several areas. I loved the bride. PotC was next and we finished up in Tomorrowland with Alien Encounter and the Timekeeper. When I went on AE last year, I didn�t find it scary at all. Maybe it was because I was really tired or maybe it was because it was nighttime, but this time I screamed as much as anyone. By 11:45pm we had reached the dead zone, a time frame where if your body doesn�t get sleep, it will make you pay. So we exited the park. Of course I walked right down the middle of Main Street, dancing most of the way to the snappy music that was playing. If you�re there when they have the E-Ticket Express�.DO IT! Just to see the MK that empty is a thrill. Caught the bus back to OKW. The buses are running on a manic/depressive schedule. Either they appear instantaneously or you feel yourself aging while you wait. Go figure :/ Passed out about 1 a.m. 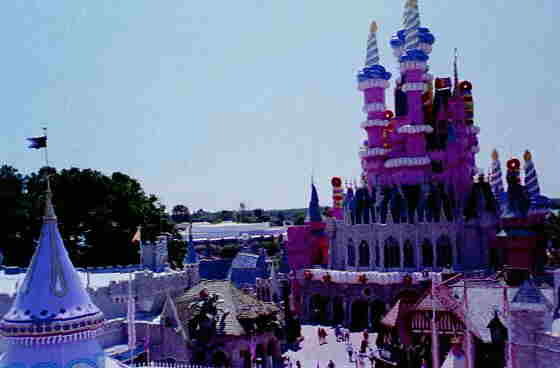 The Castle Cake From The Skyway. The View From My Patio At The Old Key West Hotel. Woke up at 7am. A beautiful day so I sat out on the patio and had my coffee. 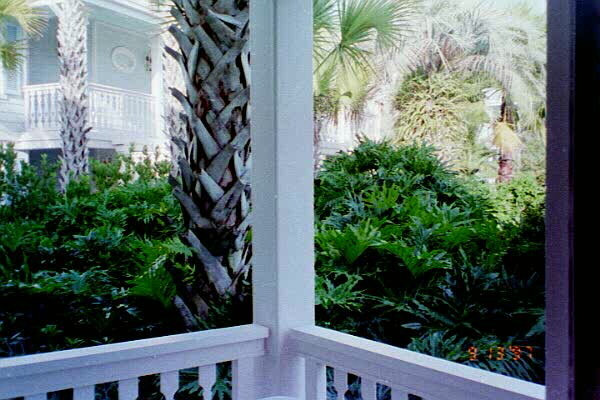 Each unit at OKW has it�s own private patio with 2 chairs and a small table. It was just me, the birds and a cute bunny. Got dressed after a bit and set off to Typhoon Lagoon by 9:30am. Got there a few minutes before it opened and then went right to my favorite spot next to the Leaning Palms clock. When I got to the river, I was the only one in it. For half the ride it was only me and the water. Then I got to the large waterfall. Because there was no one in the river, all the tubes had backed up directly under the waterfall. The tubes were 10 deep and the lifeguard , who I assume could not leave his post, was desperately trying to free them up to no avail. I offered to help and he said sure. After about 7 or 8 minutes all the tubes were on their way so I hopped (rather gracefully I might add for an "old" lady) into my tube , waved goodbye to the lifeguard and was on my way. Do you think I could get a job doing that full time?? By then a lovely couple from England had caught up to me and we spent the next 10 minutes discussing the internet�only in Disney World. They were very interested to learn that there were Disney news groups. I exited the river and went into the wave pool for a while. Then went over to do 2 of the tube rides. I don�t mean to put TL down but after riding the slides at Cedar Point, I must say that they are far superior. TL�s slides are prettier to look at though. The Cedar Point slides are higher and the rides last longer. By now I was getting pretty hungry so I got some lunch and then did some shopping. I bought one of the beautiful 25th anniversary beach towels. Well between the late night last night and all that water, I was getting pretty tired so I managed a glorious 45 minute nap on the beach even though I was right under the speakers blasting "surfer" music. Chris and Jen showed up and did several rides and then we left to return to OKW to try their pool and hot tub. I was missing the slide at Port Orleans, which remains my favorite resort. For supper we ate at Cape May and enjoyed the seafood buffet. I really enjoyed the steamers but the shrimp and Caesar�s salad were awful. I�m from New England and nobody does seafood better then we do here. After dinner we went to the gift shop at the Yacht and Beach Club where I found one of my "must have" purchases. A 25th Anniversary clock for my computer room. Had it sent back to the room and had a message when I returned to the room at 10pm that it was already here. What a great convenience. After supper we went EPCOT and explored a few of the countries. I had mostly made up my mind in advance that I wasn�t going to like Illuminations 25. To me the original Illuminations was the perfect blend of fireworks and music, and if it ain�t broke, why fix it. Fortunately I-25 wasn�t as bad as I thought it would be. Actually the fireworks were somewhat better but who found that music at the end of it?? It was terrible. Please, oh Disney leaders, returnith us to the original Illumination�Amen! (But you can add on those extra fireworks if you don�t mind) We had toyed with going to Beaches and Cream for a late snack but all of us were still too full from supper. Instead we decided to call it a night and return to OKW arriving back here by 10pm. More On Trip #6 Including Oldie Pictures of "The World"